The deadline for articles, press releases and sponsored White Papers for the next issue of S&T Journal (e-Digest) No.8, Vol.95, August 2008 is 15 August 2008. You can submit your article or press release online. For more information and instructions of preparation click <here>. This course is suitable for engineers who design different digital and intelligent sensors, data acquisition, and measurement systems. It should be also useful for researchers, graduate and post graduate students.The prerequisite for the course is a basic knowledge of electrical circuits and systems. Course will be taught in English. Each attendee will receive a certificate of attendance at the course. An advanced engineering course describes modern developments and trends in the field of sensor systems and digital sensors design. Its background is based on programmable parameter-to-frequency (time) converters as a smart sensor core and structural-algorithmic methods for data extraction in order to move from a traditional analog signal domain to frequency-time signal domain (frequency, period, duty-cycle, pulse-modulated, time interval, phase-shift, etc.). Working in the frequency-time domain simplifies design, and obviates some technical and technological problems, due to the properties of frequency as informative parameter. After a general overview of data acquisition methods, modern smart, digital and quasi-digital (with frequency, period, duty-cycle, pulse-width modulated (PWM), phase-shift, pulse number, etc., output) sensors, smart systems details are discussed including: sensors, ADC (frequency-to-digital conversion based on advanced methods for frequency-time domain parameters measurements with adaptive possibilities), communications buses, PC interfacing and software. A systematic approach towards the design of low-cost high-performance smart sensors systems with self-adaptation and self-identification possibilities is presented. The proposed design approach compatible with MEMS and system-on-chip implementation. It is based on the novel integrated circuits as the Universal Frequency-to-Digital Converter (UFDC-1, UFDC-2 and UFDC-1M-16), Universal Sensors and Transducers Interface (USTI and USTI-1M-20), and can overcoming current hurdles to truly widespread deployment of smart sensors and systems. Different examples of sensors systems will be given and discussed in details. 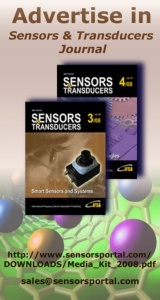 US demand for sensor products (sensors, transducers and associated housings) is projected to increase 4.3 percent annually to $12.7 billion in 2012, supported by increasing output of major sensor-containing products such as motor vehicles. Demand for sensors based on emerging technologies, such as MEMS-based and imaging sensors, will see the fastest gains. Process variable sensors will continue to be the largest product type, although these sensors are expected to grow at below-average rates. While the biggest market will remain the automotive industry, growth will also be strong in military and aerospace applications. These and other trends are presented in Sensors, a new study from The Freedonia Group, Inc., a Cleveland-based industry market research firm. Through 2012, imaging, proximity/positioning and chemical property sensors are expected to record the most rapid advances. Imaging sensors - including chargecoupled devices (CCD), complementary metal-oxide semiconductors (CMOS) and thermal (infrared) sensors - hold especially good prospects, rising 8.0 percent annually. Thermal imaging sensors will receive a significant boost from rising military expenditures, as well as increased importance in new markets such as police departments, fire departments, structural testing companies, original equipment manufacturers (OEMs) and private consumers. Proximity and positioning sensors will also record rapid advances, due to increases in motor vehicle production and continued expansion of the industrial sector, both of which are large consumers of these sensors. In particular, the rebound in vehicle production will support increases not only in newer sensor-using applications such as collision avoidance systems, but also in more mature motor vehicle products such as camshaft and crankshaft positioning sensors. Overall, the automotive industry will be among the fastest growing sensor markets and will continue to represent the largest sector for sensors. Demand for sensors in automotive safety and security systems will post strong gains. In addition,further gains will come from automakers’ desires to add value to their vehicles and differentiate themselves from competitors. While the industrial sensor market will post below-average growth due to the high degree of maturity and downward pricing pressure, increased aerospace equipment shipments and defense expenditures will continue to drive strong growth for sensors in the military/aerospace markets.